From the collection of the Museum of London. 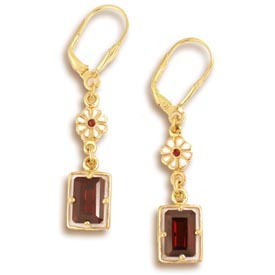 These earrings are inspired by an enamel and garnet piece of jewellery from the Cheapside Hoard collection. The "Cheapside Hoard" is the greatest collection of Elizabethan and Jacobean jewellery ever found. The jewellery was discovered in an old wooden casket beneath one of London's busiest streets called "Cheapside" and had lain undisturbed for nearly 300 years. Vermeil with garnets and enamel. Height 1 3/4", Width 1/4"